Is your home space-challenged? That's no reason to give up on style! Small Room Decorating features real-life bungalows, apartments, condos and cottages-many as minute as a few hundred square feet! Lots of hands-on information from design experts will help you tackle clutter, home organization and downsizing. We offer decorating ideas for every room and offer solutions like double-duty furnishings to help you get more function from less space. 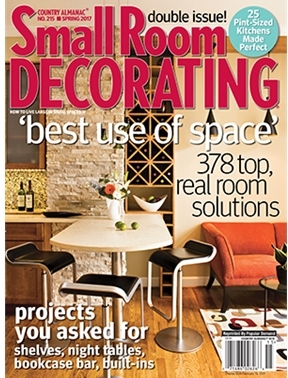 Room-making project how-to's and get-the-look shopping resources-all with an eye to making economical, eco-friendly lifestyle choices-round out each issue.